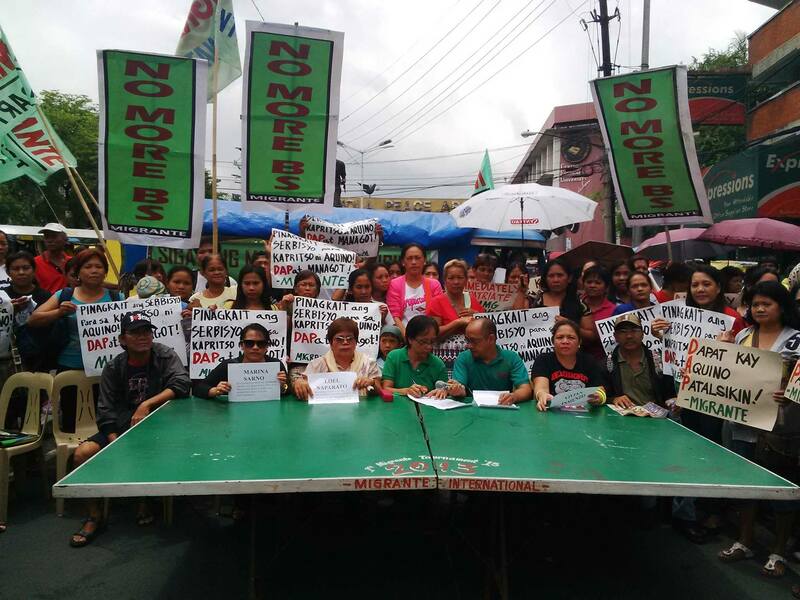 Global alliance of overseas Filipinos Migrante International today held a press conference at the Mendiola Bridge to deliver the real State of Migrants Under Aquino and to announce participation of Filipinos all over world in the People’s SONA 2014. The press conference was attended by OFWs in distress and their families, among them, Narhata Lumpingan, returned OFW who survived the war in Iraq; Encarnacion Ranario, mother of Marilou Ranario, OFW on death row in Saudi whose sentence was recently commuted due to her mental illness; Amelia Prieto, sister-in-law of OFW Fortunato Prieto who has colon cancer, no medical assistance from PH embassy in Saudi and still awaiting urgent repatriation; Loel Naparato, representative of 200 trafficked Filipino teachers whose trafficker has been released from jail by the PH government; Marina Sarno, returned domestic worker from UAE who still has not received her claims and benefits from the PH government; Gil Atienza – father of OFW victim Terril Atienza still seeking justice 3 years after his daughter’s mysterious death; and more than 80 families of stranded OFWs in MMG Company in Riyadh, Saudi Arabia. Group asks, were DAP funds sourced from OWWA “savings”?